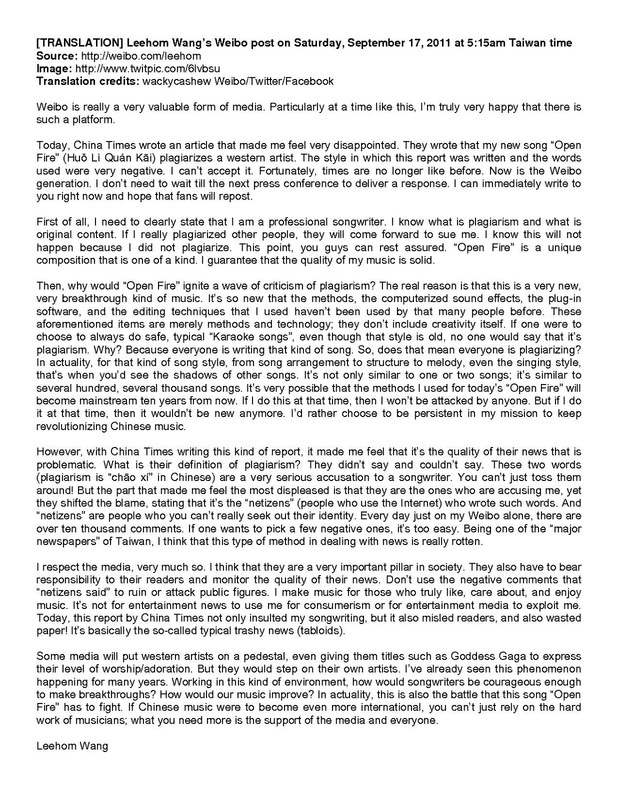 onleehom 王力宏: Leehom DID NOT Plagiarize !!! Every moron should be able to hear that those 2 songs don't sound similar... Sometimes I really worry about some people and their hatred apon other human beings that causes trouble like that! sigh! Hope Leehom feels all the support of his fans right now. yeaa... I was wondering the whole time which part is similar.. and i cant seem to find it. 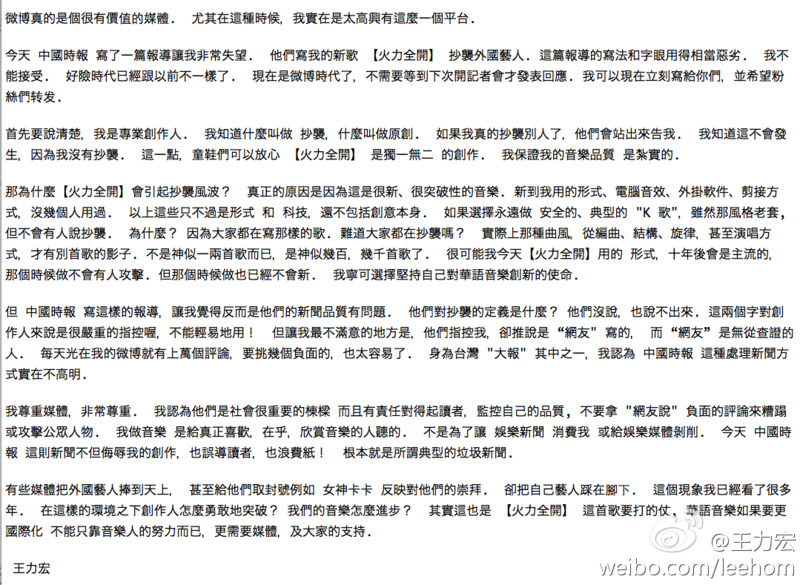 I do love your comment "hope Leehom feels all the support of his fans right now"
Neah. I wouldn't take this too seriously if I were him. Music and its styles are e-v-e-r-y-w-h-e-r-e, and it influences us day by day under our conscience. That makes plagiarism an easy accusation, yet a difficult thing to be justified in terms of art. It's not a new case. And he shouldn't be worried. He might feel it's necessary to write down a long clarification, but for me it would be more effective if he took it and went high to the top chart. After all it all goes back to his listeners to judge, to see if his album worths it. And the media? As if all fans read media that writes cheap? Really? 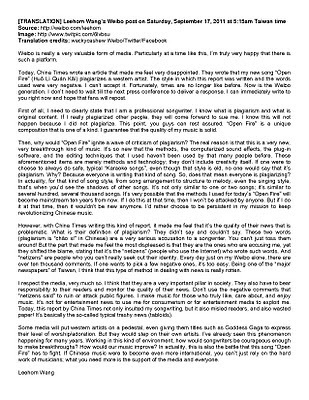 @joelliea, you know Leehom didnt say anything at first, even it's a hot topic in the internet for several days. But China Times is one of the most respective newspaper in China. Can you imagine if KOMPAS did such thing? He's not bothered with all other craps about his personal life people talked about. But when it comes to his works, he always takes it seriously. He deserves to defend himself and his work. oh, I remember Shangri-la album. He was on stage thinking that the award was for him, because Karen Mok pronounced the winner's name wrongly. People talked and talked and talked about it and even made jokes about it, humiliated him in a way. But the following year, he came back with Heroes of Earth and got the award. oh btw.. if you read it carefully, maybe one more time, you know what's bothering him the most.